With the holidays just around the corner I’m beginning to dream up some new and tasty appetizers for my guests. I think that appetizers are one of my favorite foodie things to make, because you can be so creative and the sky is the limit on flavor mixtures, textures and visual fun. 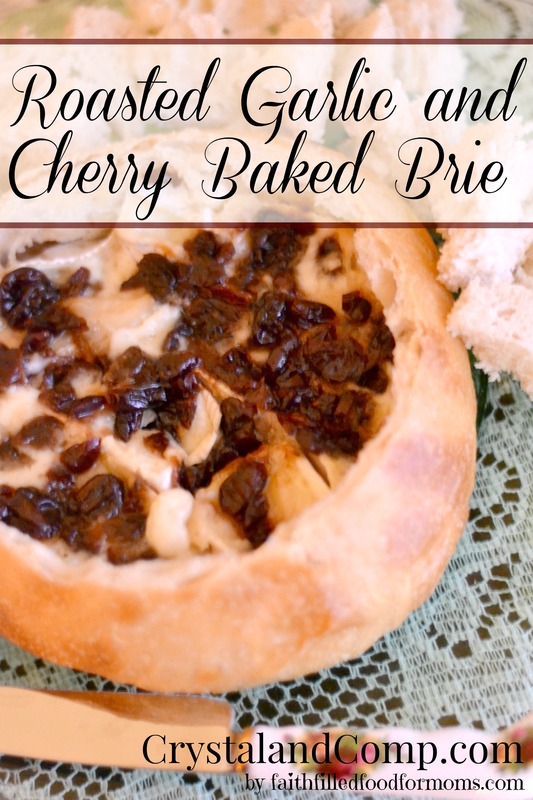 This weekend I was looking for some inspiration in a couple of cookbooks I have and ran across a recipe for Baked Brie. Then I got the idea to put it into a sourdough bread loaf that I had with roasted garlic and dried cherries. It turned out oh so YUM! I love easy recipes like this! Perfect for your Thanksgiving and Christmas crowd! 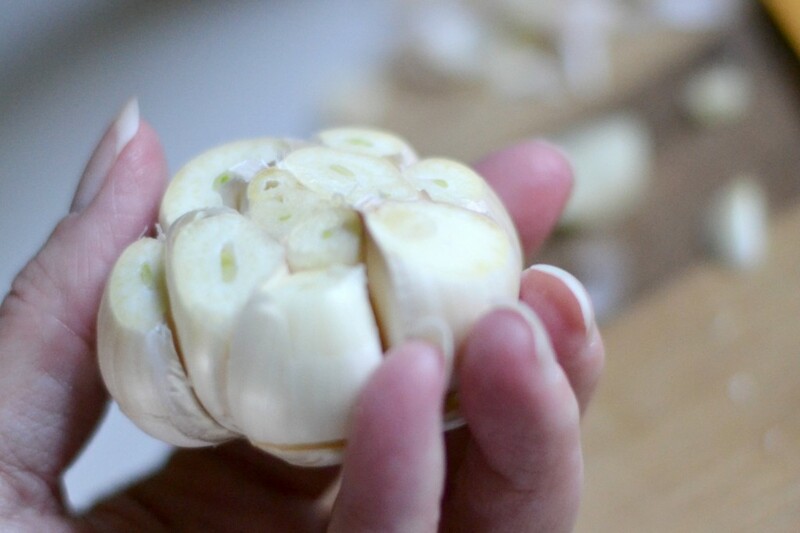 Remove the papery outer layer off of the Garlic Bulb and cut the end off for roasting. Not the end with the root. Brush top of Garlic with Olive Oil and sprinkle the Rosemary on top. Cover with foil and roast in 425 degree oven for about 30-35 min. While the Garlic is Roasting, cut the top off of Sourdough Loaf and gently cut around edges of inside to hollow out bread. Your pieces won’t be perfect. This is where the baguette comes in if you want something a little more elegant and uniform. 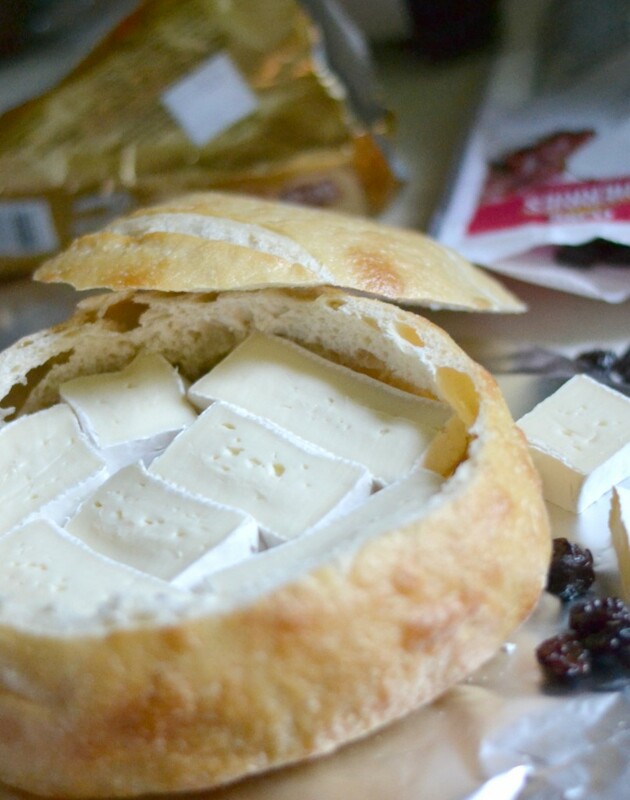 If I had had a round Brie I could have just set it into the loaf, but mine was triangle so I just cut into pieces. 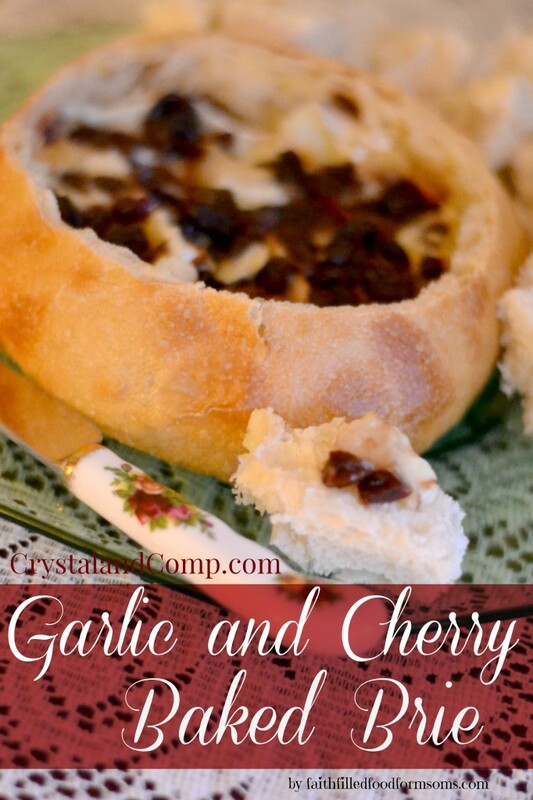 Spread Roasted Garlic onto Brie and then add chopped Dried Cherries. 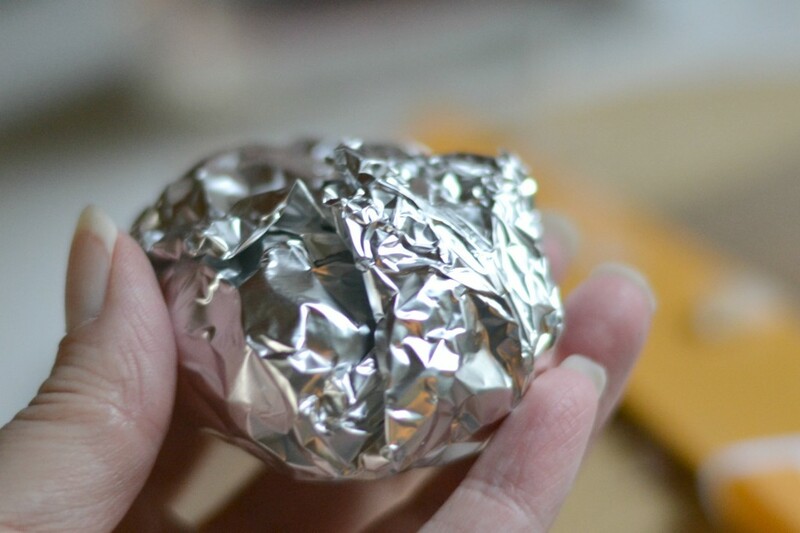 Put the top of bread back onto bread and wrap in foil. Bake in 375 oven for 45-50 min. Or until cheese is melted. This was deelish and way more simple than it looks! Impress you company by serving toasted baguette slices if you wish. The colors were festive and pretty too. HINT: You can use dried cranberries for a more red color on top. My family doesn’t really like cranberries and that is why I used cherries instead. While the Garlic is Roasting, cut the top off of Sourdough Loaf and gently cut around edges of inside to hollow out bread. Your pieces won’t be perfect. This is where the baguette comes in if you want something a little more elegant and uniform. 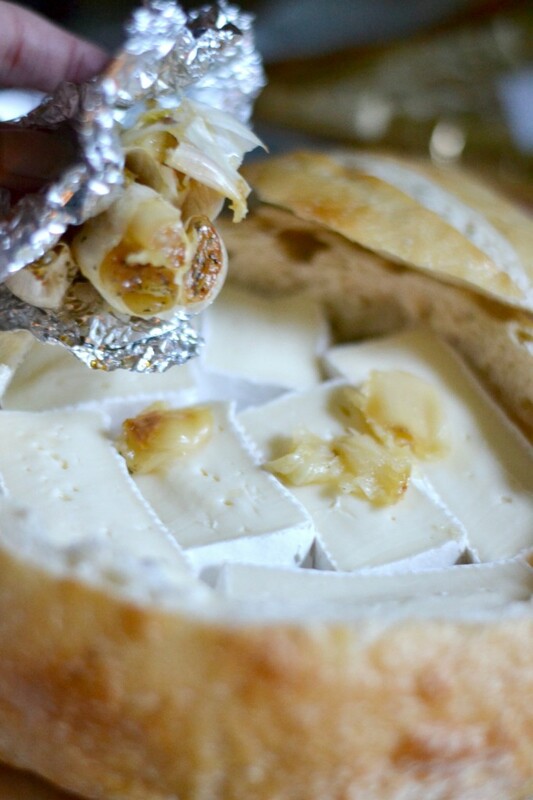 If I had had a round Brie I could have just set it into the loaf, but mine was triangle so I just cut into pieces. Yay! Can’t wait for you to try it. This looks and sounds amazing! Pinning! Oh My Goodness. That looks amazing. I’ve pinned! Visiting from Wonderful Wednesday!